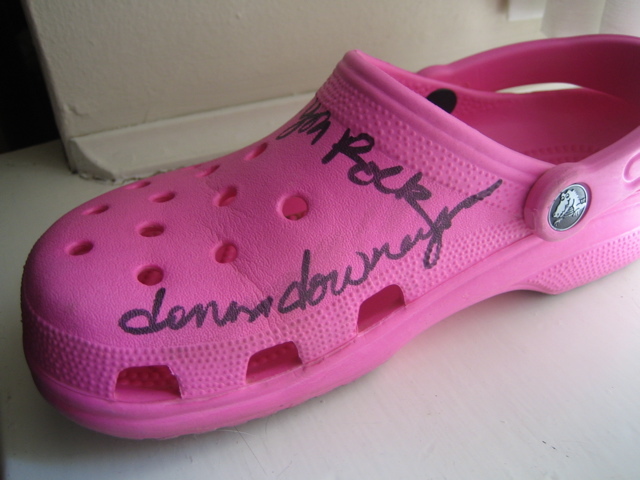 Hillary Chybinski: yes, that is an autographed croc. . .
yes, that is an autographed croc. . .
. . .that donna downey is one wild girl! to celebrate that well-known holiday, National Scrapbook Day, the Scrapford wives went to the QVC event. this year, we brought along a couple of friends, and we had a wonderful time. stacy croninger from Paper Crafts mag was there too. in her workshop we made an adorable happy birthday card. donna's workshop rocked - as usual. she helped us get started on the most amazing gratitude journal. i am always so inpsired by these events - they break me out of my mold and help me look at my hobby in a new and fresh light. ps - click on carla's link to the right to see a picture of us in the studio!